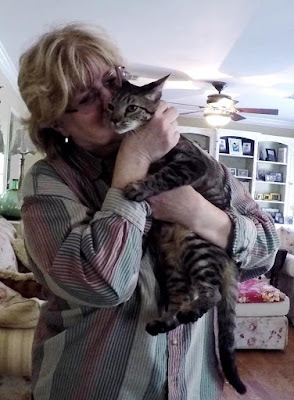 Twitty, a nine-month old gray tabby boy, wasn't expected to live this long because he has a serious heart murmur. It is so bad, in fact, that he was almost euthanized as a kitten. But Twitty got lucky. He had a merciful angel by the name of Gloria step in and save his life. Gloria has fostered and re-homed countless cats and kittens. She bottle-feeds the kittens that need it, nurses sick cats back to health, cares for special needs cats, and provides a loving home for all of them until they can be re-homed. She saw no reason to euthanize Twitty. He looked fine and acted fine. His life may turn out to be short, but he deserved the chance to live it, and Gloria was going to give it to him. When Gloria was unable to find Twitty recently, she worried about him. It wasn't like him to ignore her calls for him. She wondered if his heart had failed, or if he had gone off somewhere to hide and die. She looked for him but could not find him. Eventually, she heard him crying for her. She looked all over for him but could not locate him. He seemed to be in the wooded area next to the house, but she could not see him. His cries were coming from up high, so he must be stuck in a tree. But which tree? She looked in all the trees, but could not find him. Regardless, as long as she knew he was in a tree, she already knew who to call. When I arrived, Gloria lead me out to the wooded area, and I could easily hear Twitty calling for help. It was difficult to find a way through the jungle of privet, vines and small trees in order to find Twitty. The view looking up was usually blocked by the overhanging foliage. Eventually, I was able to isolate Twitty's cries to one of two trees, but I still could not see him. After struggling through the jungle trying to locate Twitty without success, I went outside the tree line to try the view from a short distance away. That was when I spotted the movement of a silhouette of a cat moving along the top of a large branch which sloped gently over the top of another tree. The branch was 60 feet high, and it was the only branch on that side of the tree. There were no branches above it and no taller trees nearby. This was going to be a challenge. 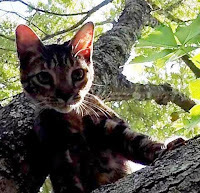 I can climb up to the branch, but I didn't see anything above it that I could use to pull myself on top of the branch. I would have to rescue this cat just by dangling below, which means I need him to come to me. Fortunately, his cries signaled an urgent and desperate desire for assistance, and Gloria had already told me about his friendly nature, so I was expecting him to cooperate. The first challenge, however, was to clear a path to the tree and an area by it from which I could work. I pulled out my loppers and hand saw and started removing privet and cutting down small trees until I had made a path to the tree and an area by it to work. I installed my rope over the branch near Twitty and prepared to climb, all the while hoping that he would not be afraid of me. 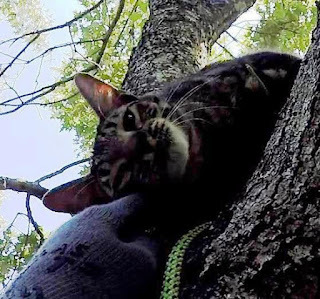 When I climbed the rope as high as I could go with my head just below the branch and feet dangling freely, Twitty was nowhere to be seen. He had walked all the way out to the end of the branch and was too far away from me to do anything. I could not even see him because of the foliage from a vine that was growing there. He was scared of me and not coming out. This was not what I needed, so I began considering my options. There weren't any. From my new vantage point, I could see a previously unseen branch shooting straight up from the top of the branch, and I could possibly use it to pull myself higher and stand on Twitty's branch. If I could do that, then I could get closer to Twitty and have more rescue options available. But to do that, I would have to go all the way back down to get some gear and climb all the way back up again. No, I decided I would just give Twitty some time and try to charm him to me. I waited for Twitty to calm down and get used to me, but that did not seem to be working. When I opened a can of food, however, Twitty's mood changed instantly. He wanted that food, and I could see him thinking about coming to me. He would not come right away, however. He seemed to be trying to come to me, but was having some kind of trouble with his footing. I could not see what the problem was because of the foliage, but whatever it was, it scared him. His voice changed to fearful concern when he attempted to step on or over this obstacle. He turned his body sideways and tried to walk that way for a few steps but did not appear to be making any progress. After a few minutes, whatever the problem was, he overcame it, and easily made his way down to me. Now I was feeling much better about this rescue. It is interesting to me how often that the cats I rescue respond very strongly to the food but don't actually eat it. Twitty did the same. He sniffed the food and seemed interested, but he never took a bite. Like the other cats, he seemed more interested in establishing a friendly relationship first, and that makes perfect sense. I let him sniff my hand and he let me touch him. I petted him and then he relaxed some more and started rubbing his head on the branch and then onto my hand. With those proper introductions made, it's a new ballgame, and he was much more comfortable. The food simply told him that I was probably a useful guy who could probably be trusted, and the food was like a promise that could be fulfilled later, when the time was right. I put the food in the back of the carrier and held it up to him. He had little hesitation in walking inside, even though he still was not ready for the food. Gloria had told me earlier that he is very comfortable with carriers, because she would take him in a carrier to adoption days every weekend. Getting him in the carrier was easy, but it was very awkward for me to hold it out and above my head and bring it back down to me quickly to close the door, all while dangling freely from the rope. I secured him to my harness and took him down to the ground. I took him inside Gloria's house and released him there. Gloria, with her big, loving heart, was very relieved and happy to see him. She picked him up and held him in her arms and kissed him. I love seeing that. It warms my heart, and no matter how difficult the rescue is for me, it all becomes forgotten and worthwhile. While inside, I met Jeremiah, Twitty's very sweet brother. Then I saw some of the most insanely cute kittens I have ever seen in my life. Gloria had bottle-fed them, and they were just now ready for her to give to Cat Haven for adoption. I wanted to take them all for myself. Twitty is in good hands. 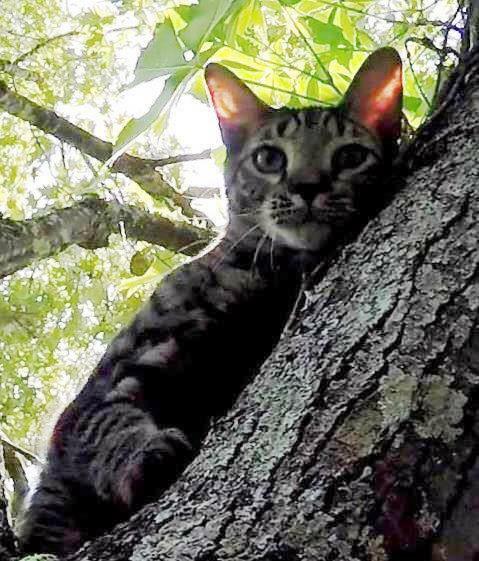 We don't know how much longer he will live, but if he has made it this far and survived two nights in the top of a tree, his future looks pretty good to me.